Dinner. Drinks. Live music. Repeat. It is a guaranteed change from the norm and thus more memorable. Memorable is good. Hitting a music venue in a ‘hood you might not typically visit otherwise is an excellent opportunity to explore said ‘hood. See above re: change from the norm. Loud music leads to close talking. If done right, close talking leads to canoodling. 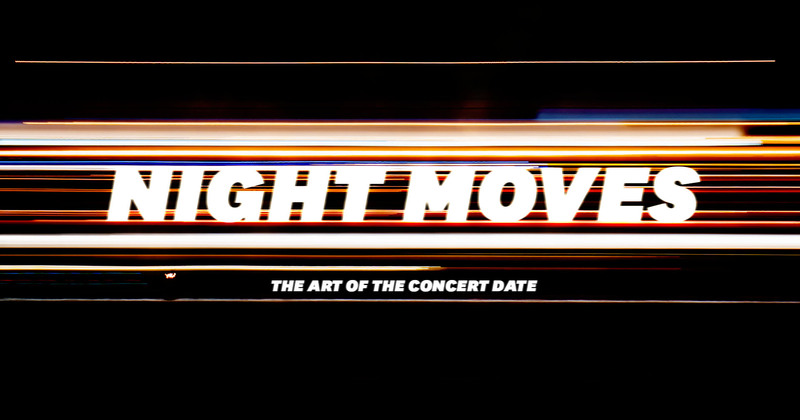 With these in mind, we bring you Night Moves*, a series of curated date night itineraries based around some of the best upcoming shows New York City has to offer. Three easy steps to get you and your sweetheart rolling on some tasty eats, frosty libations, and tunes for every taste. Canoodling is up to you. *Regrettably, the Detroit legend himself had no upcoming shows in the area and thus is not featured in this piece. IH acknowledges the irony and hopes to remedy the issue in future editions. Boasting a deft blend of pop, R&B, hip-hop, rock and soul, Melbourne quintet Jakubi are exactly the kind of band you should want to see on a date — that is, one that’ll have you shaking your tailfeather in Brooklyn’s hippest pin-rollin’ alley whether you’re familiar with their tunes or not. New Williamsburg favorite Sunday in Brooklyn, where — despite what the name would have one believe — they’re plating up their fresh take on new American seven nights a week. Pro tip: do not miss the black cod pastrami. You could throw a rock from Brooklyn Bowl’s front door and hit new hotel hot spot the William Vale, home of rooftop cocktail den Westlight, the best possible place for a killer nightcap with a view worthy of closing out a hero’s date. MY MORNING JACKET & GARY CLARK JR. Both headliner MMJ and opener Gary Clark, Jr. are known for turning up the amperage on southern-fried, ax-driven rock ’n’ roll. The kind of tunes that should have no problem filling up Forest Hills, a historic Queens gem that played host in the ‘60s and ‘70s to the likes of The Beatles, The Stones and Dylan — recently refurbished with new seating, amenities and state-of-the-art sound and lighting. Original InsideHook COO Nick Michlewicz was a Queens native, and was oft-known to drive all the way to the heart of Woodside for a bite at SriPraPhai, a joint he forever praised as the best Thai food New York has to offer. Lucky for you, it’s an easy pit stop on your way east. On your way back, stop off at Nowadays, the sprawling outdoor drink garden on the Queens/Brooklyn border. Just recently opened for the season, Nowadays is the perfect spot to keep things out-of-doors as you close the evening with sangria and ping-pong. So you’ve booked the restaurant. Concert tix firmly in your billfold. You’ve even got a plan for where to grab a nightcap afterward. Seems as though you’ve thought of everything, you date wizard you. Well, almost everything. Don’t forget that an evening spent leaning in close to be heard over the band is a chance to impress your date with a scent they’ll appreciate as much as the music. To wit: Mr. Burberry Eau De Parfum, the newest men’s fragrance from the storied British fashion house. A robust scent with an amber-and-vetiver base that recalls a classic English gentleman’s eau de toilette, it’ll keep you shipshape long after the last note’s been played. Pet Sounds is often cited as the album that gave birth to modern indie music. When you listen to Fleet Foxes — who combine CSNY-style harmonies with lush, string-driven instrumentals into 10-minute-long soundscapes — it’s easy to see why. Frontman Robin Pecknold shares Brian Wilson’s ear for dreamy pop hooks along with his aloofness: he recently took a three-year hiatus from touring to pursue a liberal-arts degree. Nearby Al Di La Trattoria is perpetually packed, but for damn good reason — husband-and-wife team Emiliano Coppa and Anna Klinger are bringing the Venetian gustatory ruckus nightly, with specialties like braised rabbit with creamy polenta and calf liver alla Veneziana making the wait highly worthwhile. Why just go for a regular ol’ nightcap when you can go for a nightcap and a bit of old folk sport as well? Just down the road from Prospect Park you’ll find Royal Palms, a cavernous shuffleboard Shangri-La boasting heavy Floridian vibes, tasty cocktails and 10 courts for your late-night puck-slidin’ pleasure. The reason John Mayer is such an ideal date musician: your date can get into Mayer’s poppy ballads while you get into his impressive axemanship. Or vice-versa. It’s 2017. Either way, Mayer’s tour behind his recently released The Search for Everything has a little something for everyone — Mayer has been switching up the set list for each show, playing a rotating cast of tracks from every one of his albums. Best part of hitting a venue like Jones Beach is the chance to eat somewhere you’d never get out to otherwise — somewhere like The Point Lookout Clam Bar, a delightfully low-key waterfront fish shack overlooking the water at the end of the Lido Beach Peninsula. Fried clam strips, whole lobsters, chill atmosphere, nice view. The ultimate power move after a show at Jones Beach is to just … keep going east. In the time it would take you to get back to the city, you can instead find yourself firmly ensconced at the Palms Hotel Fire Island, a boutique auberge with clean, cozy rooms, friendly staff and views of Great South Bay. Book a room and keep it secret until you leave the show. Even if you don’t know Little Dragon, we can nearly guarantee you’ve heard them. The Swedish four-piece has had a prolific run of guest appearances in recent years, with singer Yukimi Nagano lending her sultry R&B vocals to everyone from Big Boi to Gorillaz to DJ Shadow. Housed on the ground floor of a residential building that once played host to rooftop salons attended by the likes of Langston Hughes and Zora Neale Hurston, The Edge Cafe has become a true Harlem favorite with a deft marriage of Jamaican and British flavors from sisters Juliet and Justine Masters. Exposed brick, cozy vibes, and, best of all, a “no wifi, no screens, just connect with each other” policy. Which is just solid date advice. Let us put it this way: when you walk out of a blistering set at one of the most famous music venues in America and she asks where to next, don’t you want to be the guy who follows it up with a trip to an underground Harlem jazz speakeasy? Of course you do, and thus Ginny’s Supper Club (in the basement of Marcus Samuelson’s famed Red Rooster) is your go-to. If you’ve not spent the last couple months bumping Lamar’s smash new record DAMN. at every available opportunity, well, you need to get on that. With his fourth studio effort, Lamar has cemented himself atop the current hip-hop pyramid (apologies, Kanye), bringing production by everyone from 9th Wonder to James Blake to create a layered backdrop for his fusillade of incisive lyrics. Oh, and did we mention he has been absolutely killing it live of late? Atlantic Social, the newest effort from chef Dale Talde (whose eponymous resto has been a Park Slope staple for years) has several key factors going for it. One, the menu is delightfully eclectic, featuring left-of-center turns on American classics like chicken pot pie ramen and Talde’s famous General Tso’s chicken wings. Two, they’ve got screens galore for pre-show sports watchin’ as well as shuffleboard and pool tables. Three, it’s directly across the street from Barclays. Win-win-win. A “state of the art 24 line draught system” featuring not only their own craft suds, but tough-to-track-down brews from brewing friends all over the world. A seasonally rotating cocktail list for those who don’t dig on beer. A bangin’ patio to enjoy both on. What’s not to like about Threes Brewing?